How To Choose The Best Manual / Lever Espresso Machines? For coffee purists who desire the utmost control and quality of their coffee product, you cannot get more pure or more hands-on than using an old school manual espresso machine. These machines operate just as advertised; the user manually, rather than automatically with the switch of a button, pushes the heated water through the ground espresso into a single shot cup. True, there is a level of skill required to produce the perfect shot of espresso, but with a little practice and patience, anyone can master these machines and make a product as good as or better than any trendy coffee shop. Manual espresso machines fall into two categories: Direct Lever Machines and Spring Lever Machines. Direct Lever Machines require the operator to manually push the hot water (or “pull a shot” in barista lingo), with a lever through the coffee grounds using nothing but strength and instinct to gauge the perfect shot. Spring lever machines take a bit of the guesswork out by using a spring to supply the pressure and speed. Whichever style you choose is simply a matter of preference. Advanced coffee enthusiasts who value espresso craftsmanship and purity will no doubt appreciate the challenge and skill level that manual lever machines require of the barista. However, those that appreciate a more consistent espresso which each shot, but still value a certain amount of artistry will prefer the spring lever machines. Both styles have their fans, and which you prefer will be up to you. Coffee aficionados believe that manual espresso machines deliver the best and most authentic espresso you can find outside of Italy. Once you have practiced and perfected your own technique, you’re going to have a newfound respect and understanding for coffee. Suddenly concepts like “crema,” coffee grind textures, and measuring scales will be of interest and importance to you. Not only is this a fun and hands-on hobby, it’s cheaper to make your own lattes or cappuccinos rather than shelling out money for something you can do better at home. Also some of these machines are very impressive looking; whether you have a shiny brass Electra or a sleek and modern Flair, these machines look amazing and are interesting conversation pieces for your kitchen counter top. Portability - Are you looking for an appliance that will stay parked on your kitchen counter for its lifetime or do you want something smaller that you can carry in a backpack on a hiking trip or in the trunk of your car for a road trip. Durability - Some machines can last decades and are gorgeous enough (and expensive enough) to be considered heirlooms. Or perhaps you’re a beginner and you want something a little more simple to get you started with the basics. Expense - The price range for these machines run the entire gamut, from economical to quiet spendy. Whatever you’re willing to spend, there is a machine in your budget. Environmental Impact - While all of these machines leave little in the way of a carbon footprint, some machines do not even require electricity to work. Like learning how to ride a bike, drive a car, or pitch a fastball, learning any new skill is going to require some trial and error, and the best lessons will come through hands-on practice. The same is true when learning how to operate a manual espresso machine. After you make your purchase, take some time to read through the owner’s manual. Browse through YouTube for tutorials specific to your brand and model. Research how others do it. Learn the philosophy behind a great cup of coffee. The key is patience and practice. Be open to experimentation until you find a technique that works for you. But don’t be intimidated! Have fun with it. Try different beans and grind textures. Practice different pulling techniques. It won’t take long before you get the hang of it and start producing cappuccinos to rival the most hipster coffee shop downtown. One more thing to consider when deciding whether or not a manual espresso machine is right for you is that these machines are designed to make only one or two shots of espresso at a time. Therefore, they are not really appropriate for entertaining a crowd, unless your guests don’t mind waiting and you don’t mind playing barista for awhile. These machines are ideally suited for intimate coffee gatherings; one or two coffee lovers at a time, who don’t mind the little bit of extra time and effort it takes to make a great cup of coffee. First time? Here’s a good video for manual espresso machine beginners. Let's take a look what's out there you can consider. La Pavoni is a popular and trusted high end brand of manual espresso machines, with its name associated with authentic espresso and longevity of the machine. These Italian-made electric machines seem to be best suited for those who are very serious about their coffee and really want to embrace the artistry of it. People who love this machine enjoy the learning process and all the tinkering and experimenting that goes with the pursuit of the perfect shot of espresso. The price might be on the higher end, but it will last you a very long time with the proper care. These come with a one year warranty, but after that, if something breaks, there are a lot of places you can find online that will fix them for you. Heavy - make room for it on your counter, because that’s where it will stay. These British made machines are very modern and minimalist with few parts to worry about breaking, and a whopping ten year warranty if you do. The ROK also require no electricity to extract a shot of strong espresso that most coffee connoisseurs will appreciate. All you need is a heat source to heat your water to a near boiling point. It is portable with its own packing tin and comes with accessories such a manual milk frother, which is basically an air pump that you drop into the milk and pump away with mixed results. This is a solid, sturdy machine for espresso lovers without to pay the higher prices of other brands. Like all manual espresso machines, there is a learning curve to adjust to, but once you figure it out this machine will make a respectable shot of espresso and last a long time. Of all the manual espresso machines reviewed here, this is the most gorgeous. Plated in brass or chrome, it has an old world steampunk vibe to it and will be a remarkable conversation piece in your kitchen. The Elektra is also the only spring lever machine that made the list here, which may be somewhat easier to use for beginners than the direct lever models. These are electric machines that come with a pressure gauge and a pressure relief valve which is helpful if you tend to worry about things like boiling hot water exploding all over your kitchen. They are quite heavy, weighing in at around 25 pounds, so there is no backpacking with this small appliance and it will likely make its home directly on your kitchen counter, which is fine, because it would be a shame to hide such a beautiful machine like this anyway. Weighing in at a little over 4 pounds, this machine is made up of separate parts, some of them plastic, and packs away into a tidy carrying case that it comes with. It might look a little confusing to put together, but after consulting the accompanying illustrated manual, it shouldn’t be much of a problem after the first time. Because this machine breaks down into detachable parts, it is easier to clean than an all-contained unit. There is an option of buying a second brew head so that if you wanted to make multiple shots, you could have the second brew head preheated and ready to go. This little machine seems to impress a lot of experienced baristas. It produces consistent dense shots with the right style of “crema” that looks impressive. If you are the kind of person that can’t be without your daily espresso, this will tuck right into your suitcase—but since it is non-electric, you will need to find your own heat source for your water. 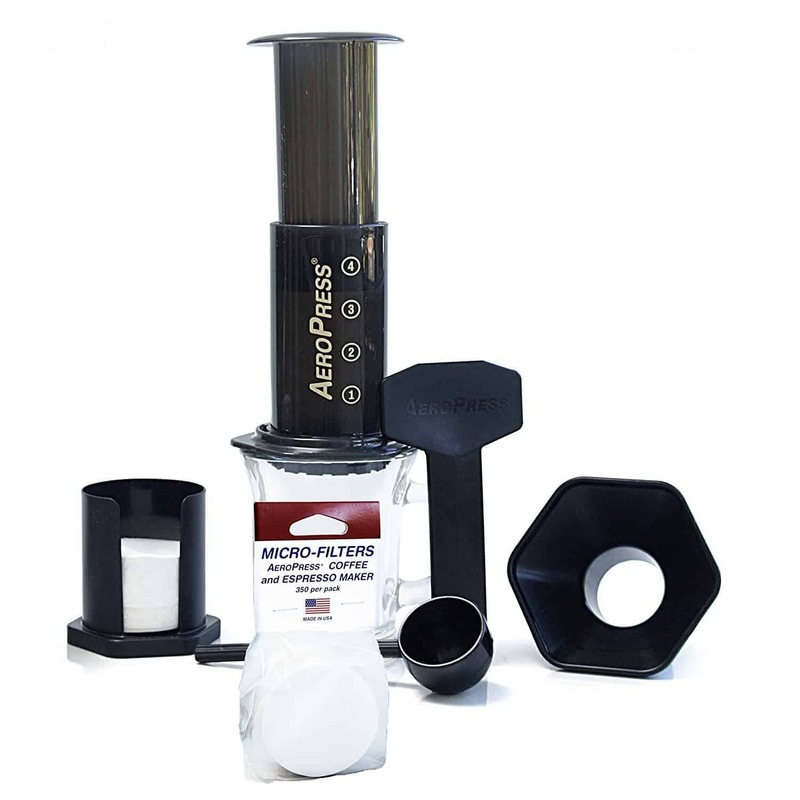 The Aerobie AeroPress seems to work more along the lines of a modified French Press. So while it might not make a technical espresso. It is on this list to cater to people who needs a make-shift manual espresso maker. This lightweight contraption, which weighs in at only around a pound. This is going to appeal to coffee enthusiasts who like to backpack or hike and don’t want to mess with heavy or cumbersome equipment while in the woods. The mechanism at work here is air compression, where you press down on the plunger and it presses the air through the coffee grounds which gives it that French Press taste. Clean up is very simple, however there are filters to deal with. This machine comes with 350 filters, but surprisingly does not come with a carrying case. We have went through all that you need to know about Manual Espresso Makers. 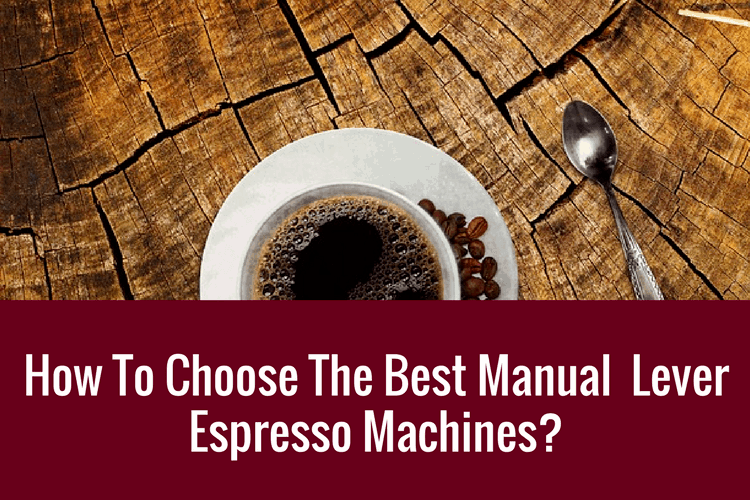 If we got to choose one, we would go with the Flair Espresso Maker - Manual Press. Due to its moderate price, all around consistency and quality of espresso, portability, easy clean up, and moderate price, this manual espresso machine will satisfy both discerning espresso drinkers and those who are just beginning with the manual espresso hobby. While there is still a learning curve to all manual espresso machines, this one seems to be the most straightforward while producing quality and consistent shots. Copyright text 2017 - 2019 by CoffeeAbode. CoffeeAbode.com is a participant in the Amazon Services LLC Associates Program, an affiliate advertising program designed to provide a means for sites to earn advertising fees by advertising and linking to Amazon.com. *Amazon and the Amazon logo are trademarks of Amazon.com, Inc., or its affiliates.